1992 saw the first performances and recording of the Nils Landgren “Unit”. The final breakthrough beyond Scandinavia came first in 1994: it was at the Jazz Baltica Festival at Salzau in Germany that the “Unit” became the “Funk Unit”. The album “Live in Stockholm” was released that year. 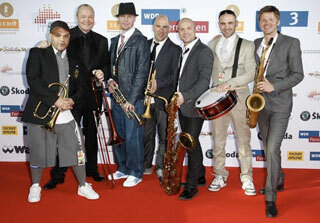 The next Funk Unit release, “Paint It Blue”, was one of 1997’s most successful albums and received Germany’s Jazz Award. The following tour of over 100 dates gave Nils Landgren and the Funk Unit their breakthrough in Germany. In between 1999 and 2001, three albums of the Nils Landgren Funk Unit were released: after “Live in Montreux” appeared in 1999 “5000 Miles” and in September 2001 “Fonk da World”, which was presented live at a special 3 day festival in Hamburg dedicated to Nils Landgren’s music. The “grooving band, which encouraged the younger members of the audience into a dance frenzy, but which was also taken seriously by the greying jazz snobs” (Spiegel), proved that it could be counted as “the best funk band in Europe today” (Stereo). In 2004, the Nils Landgren Funk Unit went full steam ahead and produced the acclaimed Platinum „Funky Abba“ album; the NLFU personal hommage to one of the greatest pop bands in history. 2007 brings the Funk Unit back again. The eighth funk album demonstrates the same killer groove as its award-winning predecessors lead us to expect. Nils Landgren Funk Unit definitely has it: the “Licence to Funk”. After having toured all over the world in 2010, The Funk Unit is pacing down temporarely but only to regenerate and to write material for the next slammin´ Funk Unit Album, to be released in 2012. Watch out! And dont worry, in 2011 we will be performing at a venue closer to you than you think! Just keep a close eye at the tourschedule, it will be updated as soon as something new happens!